We have provided answers to most questions our customers and potential customers seek from us. Go through these Frequently Asked Questions and check if your question has been answered, if not, contact us through email or use “Request Additional Info” tab on the home page to submit your question. We try to reply all emails and request within 24hours. Ques: How long does it take for my shipment to get to me in Nigeria? Ans : It will take 4-6 days to get your shipment ready for pick up at our Lagos office in Nigeria from the time the shipment leaves our USA warehouse to the airport and not from the time it arrived in our USA warehouse .Transit time is based on under normal circumstance, delays that may be beyond our control can make some shipments to add extra day/s to the specified time frame. Ques: How do you determine the weight of my shipment? Ques :Do you repack my shipments before shipping? Ans : Yes, we reserve the right to inspect and repack any shipment tendered to us according to TSA guidelines and regulations. Most repacking are done to ship every item in it’s safest and most cost effective way.Based on customer’s advice, goods can be shipped as is without repacking, but we must inspect it for airline safety purposes. Ques :Will you contact me when my goods arrive at your USA warehouse? Ans :No, we will not contact you. It is customer’s responsibility to keep tracking their goods with the local carriers like UPS,FEDEX,USPS till the goods are delivered and signed by one of Donem Cargo employees. Meanwhile, if customer calls us concerning the status of any shipment that is delivered to us, we will share such information with the customer. Ques : What is your mode of payment in Nigeria? 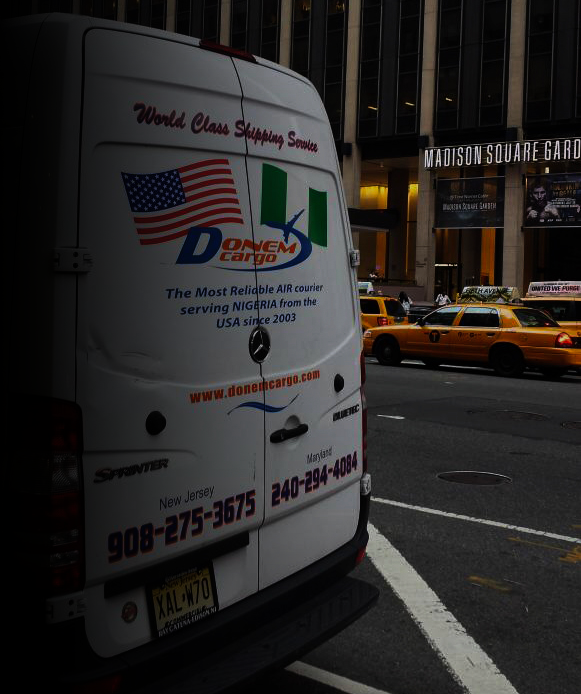 Ans : Because of the fluctuating nature of exchange rates, Donem Cargo accepts all payments in US Dollar only.Contact any of our offices for our account numbers in USA or Nigeria. Ques : Can my shipments be delivered in parts to your USA warehouse and be held until everything is complete before shipping all at once? Ans :Yes we can hold shipments that come in parts for seven calendar days, storage charge will start accruing from the 8th day until you decide to ship them. Ques : Do you notify customers when their shipments arrive in Lagos? Ans : Yes, we notify every customer through SMS or Email as soon as their shipments become available for pick up in our Lagos office. Ques : Do you have minimum weight or charge rule? Ans : Yes, our minimum charge is $80 to Lagos and $120 to all other Nigeria cities for any type of goods with the exception of documents that attracts minimum charge of $50 to Lagos and $80 to other Nigeria cities. Ques : Do you procure goods for customers that are based in Nigeria? Ans : No, we don’t do any type of procurement, customers have to order the goods themselves but can use our warehouse as their delivery address if the company they purchsed from will act as their representative in the USA. Ques : Can I make payment at your Lagos office after my shipments have arrived there before I pick up? Ans : Payment must be made before we ship out your goods from USA office, but if for any reason we ship your goods without getting paid first, we can accept cash payment at our USA office only. All other payments must be deposited in any of our bank account either in the USA or Nigeria,Donem Cargo employees in Lagos cannot accept cash payment at the Lagos office no matter the circumstance. We advice customers to clear up any outstanding as soon as the bill becomes available in order to avoid delay in picking up their goods even on Saturdays or non bank working days like holidays.